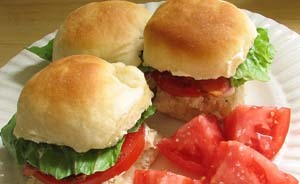 This simple BLT sliders recipe makes a great lunch or snack for hungry sports fans. And when you use pre-cooked bacon, they can be thrown together in a snap! Combine mayonnaise and basil. Set aside. Smear some of the basil-mayo on each side of the slider bun. Place a tomato slice on top of the mayo and top the tomato with a small handful of micro greens. Then take a slice of bacon, tear it into 3 pieces, and place it on top of the micro greens. Sprinkle with salt and pepper. Place top and bottom of the slider bun together and enjoy!